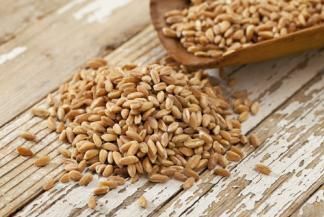 This ancient strain of hard wheat, also known as emmer wheat, has a roasted, nutty flavor and a distinctive chewy texture, reminiscent of barley. Not only is farro nearly twice as high in fiber and protein as common whole-grain wheat, but it’s also richer in magnesium. Instead of the kind known as perlato (or pearled, which means it’s been hulled completely), Weil recommends either whole farro or the semi-pearled variety, since both have more of the fiber- and nutrient-rich bran intact. Farro has long been a staple of Italian dishes (it’s said to have sustained the Roman legions) and works especially well in risottos, soups and hearty winter salads, where you can use it as you would rice, noodles or couscous. The concentrated flavors and aromas of various teas are ideal for healthy cooking, says Krieger, who has spotted more tea-infused dishes on restaurant menus lately. You can, for example, simmer dried or fresh fruit in chai-spiced tea with a touch of honey to yield a flavorful compote for chicken; use a smoky tea like Lapsang souchong as the base for a marinade or brine for chicken breast; or replace half your cooking water with a berry-flavored tea when preparing whole grains like wheat berries, bulgur or brown rice for pilafs or salads. The best part? Tea is high in flavonoids, a kind of antioxidant that has been shown to help protect against multiple types of cancer as well as heart disease. Typically sold at grocery and specialty stores in long, paper-size sheets, dried seaweed is used to wrap sushi and to flavor certain Japanese dishes. Some recent studies have found that it is full of heart-healthy compounds like antioxidants, potassium and vitamins A and B. With a sweet, nutty flavor and a crunchy texture, dried seaweed makes a satisfying but low-cal snack (just 10 calories for a single two-ounce sheet). “I like to break it up into small pieces and eat it like potato chips. Even my three young daughters like it!” Gupta says. Americans are eating less and less meat, according to the Department of Agriculture, and that’s opening the market for new protein sources. Proteins derived from brown rice, hemp and peas are showing up as ingredients in shakes and power bars. Expect to see more snack-food companies getting creative with protein-rich legumes like chickpeas, green peas, lentils, beans and peanuts. For instance, the Good Bean (thegoodbean.com) roasts chickpeas in four flavors, and they’re perfect for tossing into a salad or trail mix. The Mediterranean diet opened our eyes to the potential health benefits of traditional regional cuisines. Now, thanks to the restaurant Noma in Copenhagen (ranked number one in the world by Restaurant magazine for the past three years) and other trendy Scandinavian eateries, Nordic cooking has been getting a closer look from nutrition experts. This cuisine is delicious and good for you: It emphasizes omega-3-rich salmon, antioxidant-packed berries like lingonberries and blueberries, nutrient-dense vegetables such as beets and onions, and disease-fighting herbs like dill, parsley, cinnamon and cardamom. In addition, the hearty Scandinavian way of eating relies heavily on grains like oatmeal, rye and barley, which have all been connected to lower heart disease risk. “A 2012 study created a media storm when it suggested that eating eggs could be as harmful to your arteries as smoking cigarettes,” says Masterson. Because of serious flaws in the study—the researchers relied on some very loose correlations—“I’m starting to see a backlash against this research,” she says. There are many reasons to continue consuming eggs: They are an inexpensive source of high--quality protein (about six grams per egg, divided nearly evenly between yolk and white); provide the nutrients lutein and zeaxanthin, which may reduce the risk of age-related macular degeneration (a cause of blindness); and serve up choline, which may enhance memory. If you have high cholesterol, ask your doctor whether eggs should be part of your diet. A single serving of these flavorless Mayan seeds has more heart-healthy omega-3 fatty acids than flax, along with good supplies of protein, fiber, antioxidants and essential minerals such as calcium and zinc. Eat the seeds whole, add them to a shake (when mixed with liquid, chia forms a gel that acts as an instant thickener) or make your own pudding: Chill a can of coconut milk overnight, then blend in four tablespoons of chia seeds, four tablespoons of unsweetened cacao powder, one to three packages of stevia and half a teaspoon of vanilla extract. As a breakfast food, oatmeal is tough to beat: Its high water-soluble fiber content stabilizes blood sugar levels and helps clear cholesterol from the body. But if you want to start your day with something more exciting than oatmeal sweetened with brown sugar, you’ll be happy to hear that Hall has begun to see savory takes on this staple. For example, you can find recipes for oatmeal topped with herbs (try rosemary or fried sage), cheese (like ricotta, Parmesan or Cheddar), vegetables (like scallions or squash) and even fried eggs. Fun fact: Peru has a large Japanese community (because of a wave of immigration in the late 1800s), and this influence—think raw seafood, ginger and peppers, and an emphasis on clean, pure flavor—can still be felt in the country’s brand of Latin cuisine. Look for tangy, high-protein ceviches (seafood marinated in citrus and spice) and tiraditos (seafood marinated in citrus, hot peppers and ginger). “My favorite Peruvian ingredient is ají amarillo paste, which is made from a mild and fruity yellow chile,” says Garcia. “Add in a teaspoonful or two to give a kick to vegetable dishes such as cauliflower puree.” You can make the paste or buy it online or at your local market. “We’re learning how important healthy digestion is for preventing disease and maintaining energy levels,” Koff says. Enzymes break foods into blocks of molecules that can be used to fuel the body. “I like to think of them as little personal assistants for the digestive system that work to give you better access to the nutrients in the food you eat,” says Koff. Pineapple, papaya and grapefruit are great sources of these enzymes, and they’re easy to slice to provide a quick snack or add to a salad. Want the health benefits of coffee without the bitter flavor? Green-coffee-bean extract made from unroasted (that’s where the green comes from) coffee beans is showing up all over the place. It has high levels of chlorogenic acids, powerful antioxidant compounds that all but disappear when coffee beans are roasted. Chlorogenic acids have been connected to weight loss and a lower risk of type 2 diabetes. Since green-coffee-bean extract is raw, it doesn’t taste like regular roasted coffee and is actually slightly sweet. This means it can be blended into fruity drinks for a caffeine punch. Starbucks, for instance, recently launched a line of drinks, called Refreshers, that combine fresh juice and this energy-boosting extract. “In terms of overall health, I can’t stress enough the importance of probiotics, aka ‘good’ bacteria,” Northrup says. “They help us digest foods, control inflammation, battle heart disease and more.” Yogurt, of course, is the classic source of probiotics, but now people are looking for less obvious possibilities. Fermented foods like miso, tempeh, kimchi and sauerkraut are all rich sources, and they tend to contain high levels of food enzymes as well. Be on the lookout for natto, a traditional Japanese food made from fermented soybeans that you mix with rice or use as a condiment for vegetables. It’s a good source of protein as well as vitamin K and an enzyme called nattokinase, which is purported to prevent harmful blood clotting. For centuries, Asians have been fermenting garlic at high temperatures to make this sweet, chewy delicacy. Now you can buy black garlic online or at your local specialty grocery store. Unlike the regular variety, it doesn’t have a pungent odor; therefore, it’s less likely to give you bad breath. What you do get are strong doses of antioxidants (more than from regular garlic, according to some reports), selenium and—as a result of the fermentation process—probiotics. Mix black garlic into sauces as you would regular garlic or simply spread it on toast like peanut butter.